Animal kingdom is closely connected with many people for various reasons. Visitors traveling in zoo and museums enter with preconceived notions about what to expect, the atmosphere and overall visuals of jungle like sites but it seldom turns out other way around when visitors think of Khao Kheow Open Zoo of Bangkok. Best part of being in one of Thailand’s best Khao Kheow Open Zoo is that three out of five times when a visitor walks in they get to see something new at this amazing zoo. Variety In the zoo adds spark no matter where you go and what you do? That’s why visitors are always thrilled when they visit zoo. 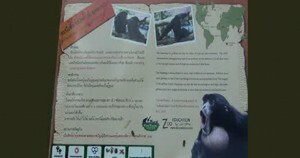 Few days ago during the last week experts from of the Khao Kheow Open Zoo made an official announcement of the presentation to the public of a newborn baby Siamang Gibbon. This new additional certainly surprised everyone and people who were around were simply amazed by the new born. The experts from Khao Kheow Zoos believe that this type of Gibbons has unique species. They have pink and grey markings around their necks. These Gibbons are carefully raised by their father before being released into the custody of their mothers.